At KP Kreative, we are big believers in using LinkedIn as part of our marketing strategy (just check out past blogs here and here). Having a Company Page on LinkedIn gives you an opportunity to engage in conversations that are important to your brand, grow your audience, and tap into your current employee base to spread your goals and mission. Just last month, LinkedIn relaunched Company Pages as LinkedIn Pages and added new features. If you log into LinkedIn right now, you’ll probably notice some obvious differences. The user interface is easier to navigate and cleaner in appearance, and there are quite a few new features to help you use your LinkedIn Page to grow your business. Here are our tips to help you use these updates to your advantage. Admins, or community managers, can make or break an organization’s social strategy and it seems that being plugged in is more important now than ever before. Although more than 57% of LinkedIn’s users are from their mobile app, many of the benefits that individual users enjoyed were not available to LinkedIn Page admins. 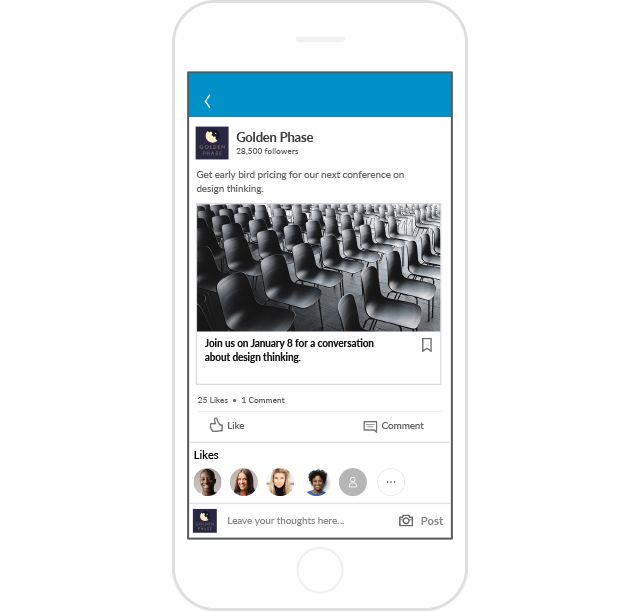 Now LinkedIn’s mobile app allows you to post, update, and respond to comments from anywhere, which makes it easier for you to manage the conversations your company is active in. Another benefit to LinkedIn’s more recent update is that LinkedIn Pages allows you to tell more compelling stories. You’ve always been able to post content, images, and videos to LinkedIn Company Pages, but now you can share Word Documents, PowerPoint presentations, and PDFs. You can also associate your Page with hashtags, so you can actively listen in and respond to conversations relevant to your brand. Get to know (and grow) your audience. Part of creating successful content is knowing your audience. If you don’t know what type of content will add value for that particular community, your posts can fall flat. The more in tune you are with the unique needs and challenges of your audience, the more likely your content will resonate with them. To help you understand what content will work your for audience, LinkedIn Pages now offers "Content Suggestions." Content Suggestions allows you to select your audience and then provides content and topics that are currently trending. This allows you to create content that you know your audience is already interested in, and makes it easier than ever to keep active on LinkedIn, thus improving your chances of driving traffic to your Page and increasing your followers. Now that you are actively creating and sharing interesting content for your audience, you need to evaluate and determine the success of your content strategy. LinkedIn Pages gives admins improved visual analytics to better understand success on the platform. You can filter your dashboard to see how your content is performing over time, and adjust your strategy as needed. Admins also receive a monthly summary email, which provides more in-depth information on who is visiting your Page and the content they are interacting with. LinkedIn has long been understood as the platform to find your next job or attract new talent to your business. But have you thought about focusing on using your employees to grow your brand? Your employees are your greatest asset and can be your biggest advocates. By giving them a voice, you can build stronger connections with your audience. LinkedIn Pages sends admins a notification every time their company is tagged in a post. That means you will be better able to discover and share public posts from other Pages, including testimonials from your customers, product reviews, and updates from your employees. This makes it even easier to fill your Page with content, expand your reach, and build a stronger brand.